Raising chickens or other animals on a homestead means the right type of feed is essential. The cost of feed will vary based on numerous factors. 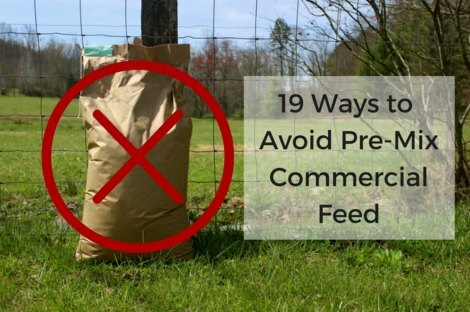 However, there are many ways to avoid pre-mix commercial feed if you are looking for ways to save money. The best way to think of alternatives to pre-mix commercial feed is to compare it to food grown for your own use. Many of the same techniques can be used to supply feed for chickens or other animals on your homestead. However, creative ideas are also available for you to use. You need to determine which alternatives to pre-mix commercial feed will work best for your situation. The options to use may depend on the size of your property and the results you desire. This means a compromise may be necessary based on the type of feed you want to use and the work that is required.